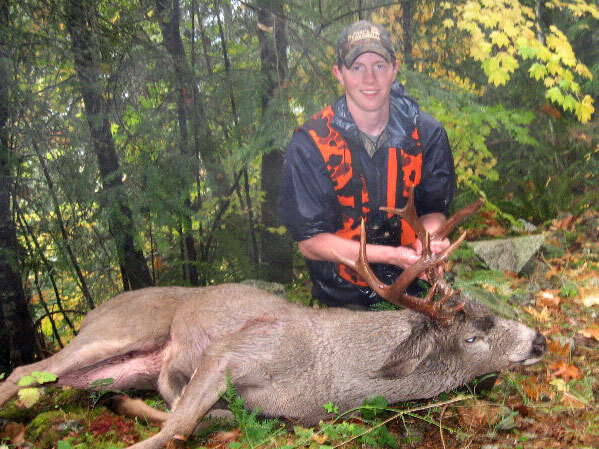 I shot this blacktail on October 24 2006 in Washington state, in the Cascade River Valley. I hunter for 11 days and saw many does, but only three bucks. On the 24th I hiked way up into the old growth timber on Forest Service land. After hunting all morning in the pouring down rain, snow, and sleet, I was soked and tired. I started heading down the mountain. About 10 minutes into my hike down, I looked up and this buck was standing 50 yards from me. I made a good shot on his lungs and started the long pack out. He has 5 legal points on one side and 7 legal points on the other side. Description: I shot this blacktail on October 24 2006 in Washington state, in the Cascade River Valley. I hunter for 11 days and saw many does, but only three bucks. On the 24th I hiked way up into the old growth timber on Forest Service land. After hunting all morning in the pouring down rain, snow, and sleet, I was soked and tired. I started heading down the mountain. About 10 minutes into my hike down, I looked up and this buck was standing 50 yards from me. I made a good shot on his lungs and started the long pack out. He has 5 legal points on one side and 7 legal points on the other side. Love all the TRASH on him. Awesome Blacktail. Congrats!